Posted by Craig Palmer on July 17, 2017. Over the past couple of months, we’ve focused on the Behavior section of the Profiles Sales Assessment Concurrent Performance Model Overview in order to show how a 12 person team might create a tension free environment by properly executing an assessment. Read all of the posts here! Let’s now focus on the Thinking Style section of the Profile PXT and PSA Assessments. This section gives us tremendous insight into the speed in which individuals process and assimilate information. A person’s Cognitive Abilities is a God given trait. Understanding the people’s Thinking Style helps leaders and organizations align specific roles to optimize an individual’s Cognitive Abilities. The Verbal Skill and Numeric Ability sections of Thinking Style are the only sections of the PXT and PSA assessments that have right or wrong answers. Verbal Skill measures a person’s understanding of words and their definitions. The farther right a person scores the stronger their vocabulary. Numeric Ability measures a person’s ability to solve a variety of different types of mathematical equations. The farther right a person scores, the more astute they are at solving math problems. Verbal Reasoning tells us the speed in which an individual can pull key facts out of what they are listening to or reading and then turn around and use those key facts in their daily persuasion and problem solving activities. The farther right a person scores the faster their God given ability is to process this verbal information and integrate it into their daily activities. Numeric Reasoning measures the speed in which an individual can process and assimilate key facts from groups of numbers or sets of data and then turn around and use those key facts in their daily persuasion and problem solving activities. Again, the farther right a person scores the faster they are able to process and integrate numeric data. If a person scores to the right in Verbal & Numeric Reasoning and in the Decisiveness trait of the Behavior section, they’re likely able to make decisions very quickly! The Learning Index line in the Thinking Style section aggregates the individual’s scores in Verbal Skill, Verbal Reasoning, Numeric Ability and Numeric Reasoning to provide an overall result regarding how quickly people will process and assimilate information. Using a left oriented score perspective regarding Learning Index, this “does not mean” that someone has a low IQ or is not bright or intelligent. It “does mean” that left oriented people will take longer to process and assimilate. They will have to work harder, re-read and ask clarity questions in order to get to the same point more right oriented people have already gotten to. If they also fall to the right in the Objective Judgement Behavior section, they will also need a lot of facts in order to make a decision which could take them a while. As we review Thinking Style in our team example, we notice a wide range of scores with the leader having a Learning Index of 10. 2.5% of the population will score a 10. Said inversely, 97.5% of the population will process information more slowly than this leader. If the leader also scores to the right in the Energy Behavior section, he/she likes to have a lot on their plate and being a quick learner will help! All team members are left of this leaders 10 learning index. The Thinking Style section of the Profile PXT and PSA provides a roadmap regarding how to optimally flow information to their team to optimize their ability to process and assimilate the information they are disseminating. This leader, in order to optimize execution and create a motivational environment must consciously “slow” the flow of information to their team. This will allow the team members to process and assimilate the information at their own speed and will mitigate team tension. As the team members share information with their leader, they will understand from this team report that he/she is a really fast processor. While you cannot make your brain process faster, with preparation, the team members can deliver and review information more quickly to accommodate the leader’s fast processing capabilities. This is another excellent example of mitigating tension leading to optimal execution by increasing a team’s awareness of how they process information. 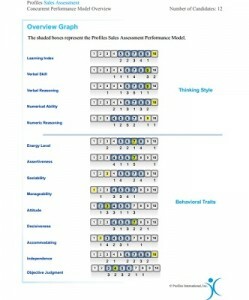 Get your various functional teams involved with the Profile PXT and Profiles Sales Assessment today. Utilize our consulting programs to work with your functional teams and achieve higher performance! For more information on How to Execute with ANY Audience, click here to read every blog post in this series. Profiles Incorporated provides personalized consulting to support the assessment results of your employees. We also provide in-depth training for managers to maximize the value of the assessment information and administrative training that allows you to take this information in house.